I”m in the middle of a massive fridge, freezer and pantry clean-out, which means that all of my dried beans and legumes have got to go before I even think about putting in another order from Rancho Gordo or visiting the bulk bins at the local health food stores. While a lot of beans have risen in popularity over the past decade or so (I definitely remember thinking that beans were really uncool as a kid, although I don’t know where I got that idea), I’m not sure if any of that popularity has extended to yellow split peas. Even Safeway, the only supermarket that carried them out here, stopped selling them a few months back. And that, my friends, is kind of a travesty. After going overboard with lentils a couple years back, yellow split peas have become my pulse of choice. They’re great because, like lentils, they don’t require super-lengthy cooking times or overnight soaks. And with their happy and vibrant hue, they’re like a warming bowl of sunshine. 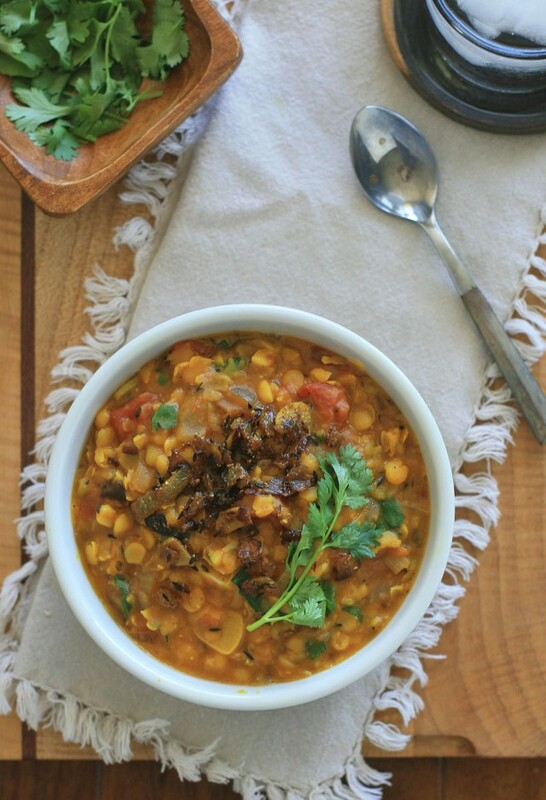 It’s no secret that I’m a fan of South Asian yellow split pea dishes (as evidenced by this, this, and this), but this Indian yellow dal just might just be very favorite of the bunch. 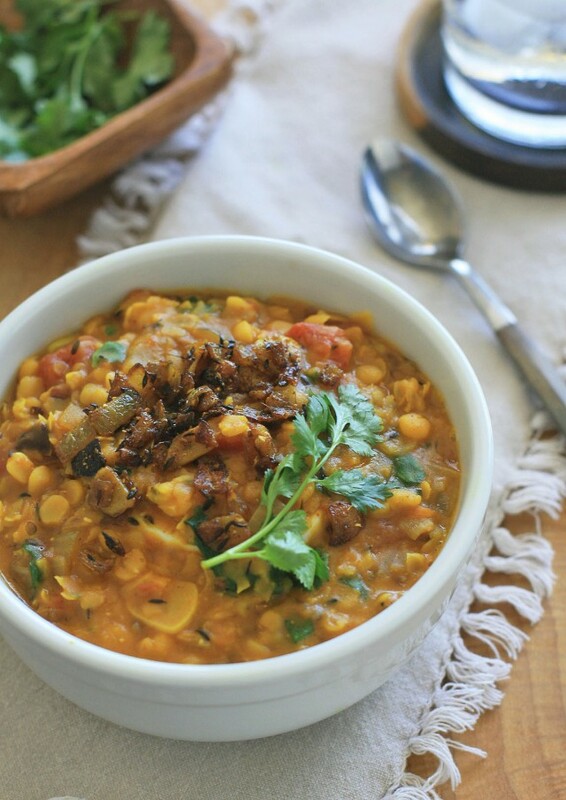 It’s flavored with plenty of sauteed garlic and onions as well as a melange of my favorite Indian spices. 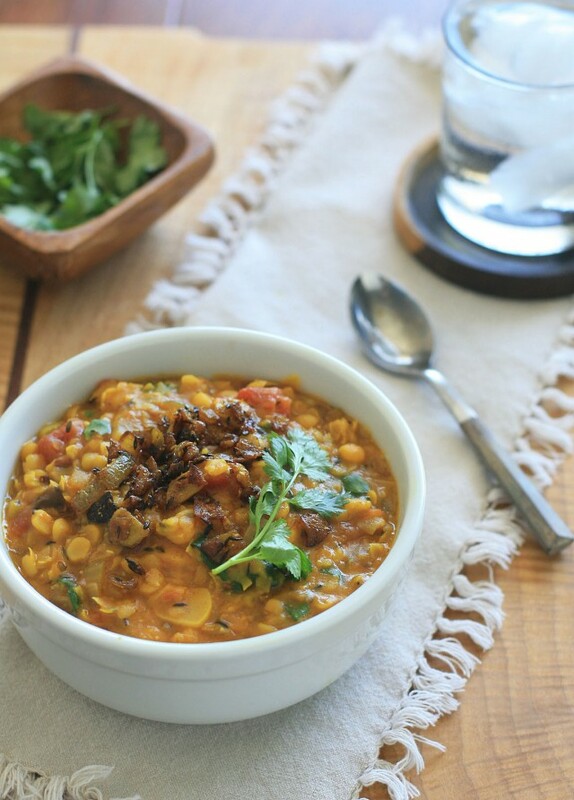 A large pat of butter gives the dal an unexpected richness and it’s finished with a hefty dose of chopped cilantro. Rinse the yellow split peas in a fine-mesh sieve, place in a bowl, cover with water, and let soak for one hour. Drain, place in a large saucepan and add the water and diced tomatoes. Bring the mixture to a boil and then reduce heat, cover and simmer until the split peas are tender, about 40 minutes to an hour, depending on the freshness of your peas. Heat the oil in a medium saucepan over high heat. When the oil begins to smoke, add the cumin seeds and cover with a lid or splatter screen. Let the cumin seeds sizzle in the oil for about 10-20 seconds and then carefully slide in the onion. Cook, stirring frequently, until the onion has softened. Add the garlic and continue to cook until the onion turns golden. Add the coriander, turmeric, cayenne and salt and cook for another minute or two. Add the onion mixture to the split pea mixture and then add the butter and cilantro leaves. Cook for about 5-10 minutes to allow the flavors to meld.